When three bathrooms become two. This bathroom used to be very skinny and long and across the hallway was another bathroom (that also separated two living areas) so it made sense to delete two bathrooms that were not user friendly and make one larger, lighter and brighter space that suited us more as a family. This bathroom was the second bathroom to be renovated so I wanted the space to compliment the bespoke features of the 'girls' bathroom (see below), like the all white tapware, the round handles, the double vanity and the hanging exposed bulbs. Same same but different. Where the girls bathroom had the yellow 'shower box' at the end I wanted different accents for this space. 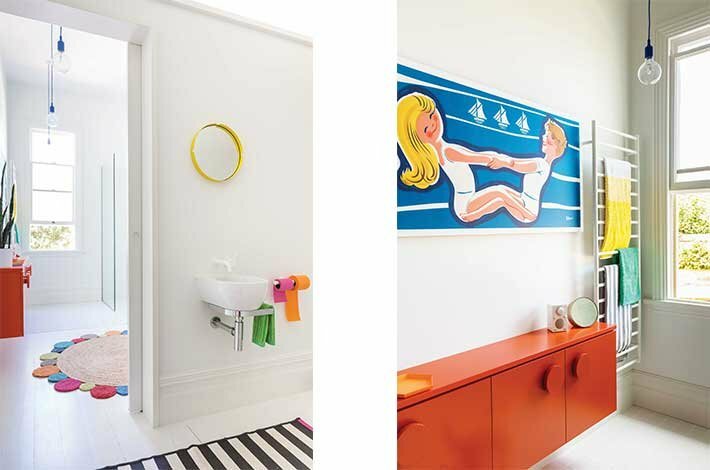 The large floating orange cabinet was perfect for storage (a must in a bathroom) as well as adding a colourful right hand jab. The orange came about becasue of the Laminex Solid Surface 100% acrylic Neon Orange benchtop, which I colour-matched to Dulux Hot Embers and sprayed to make it look like a floating orange sculpture. The Muuto pendants I chose a royal blue in the main bathroom with a yellow one for the toilet. The toilet also features a disco ball which I sourced from a theatre lighting place in Auckland which I found online. My local electrician throught it was quite mad but once it was installed I think he was quietly chuffed. It changes colour in random order - very pleasing indeed. The window ajoining the toilet and the bathroom allows it to be seen from both areas. Genius and super for shower-based singing solo's. We decided to paint the floor white which was actually a test on my behalf as I have always wanted painted floor boards and the house has stained wooden boards. We are so pleased with the Dulux paint finish that we will eventually paint all the wood out in the hallway and the kitchen/lounge. The Armadillo & Co rug was also the perfect addition to the floor with it's playful vibe and tough wearing qualities. The artwork I spotted online fron Vintage Posters in Melborne - we had been spying their range and when I saw this poster I knew that it would be perfect for this space - at 3m long it was also a fingers crossed moment to see if it was a perfect - and it was. It's bold, retro and playful vibe is perfectly suited to our aesthetic as well as adding the colour injection required. I also took a punt on the orange of the customised cabinet matching the orange in the artwork - Boom, perfect match! The was the first bathroom that was rennovated - The Girls Bathroom. This space has a triple access for both my daughters bedroom as well as an external door out to the pool. Lucky ducks. This makes it a perfect wet area and hides the masses of wet towels that girls of this age seem to use. 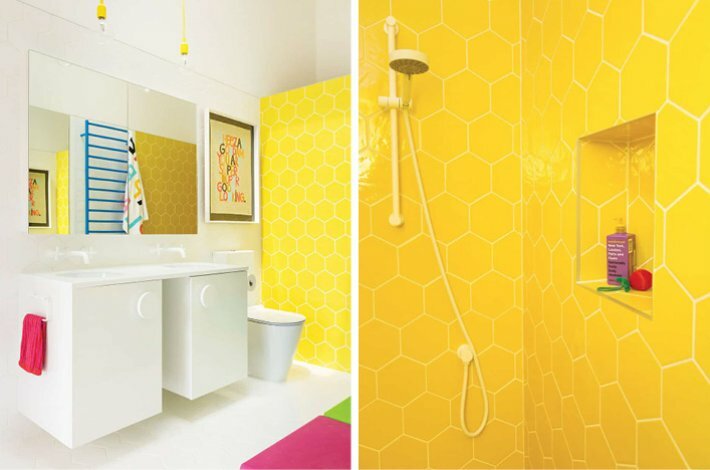 The yellow hexagon tiles mark out a shower/bath area and the aim was that it looks like a yellow box at the end of the room. The tiles are the main feature of this bathroom and we sourced them from Academy Tiles in Australia. It was also in my design plan to have no chrome in this bathroom and I managed to source the beautiful and simple white tapware and products from Astra Walker (Australia). The only thing I couldn't avoid being chrome was the tile trims as at least your eye is drawn away from that with the bolt of yellow! The addition of plastic stools doubles as access to storage above the sinks for the kids as well as a place to 'hang out' or rearrange to suit their needs. 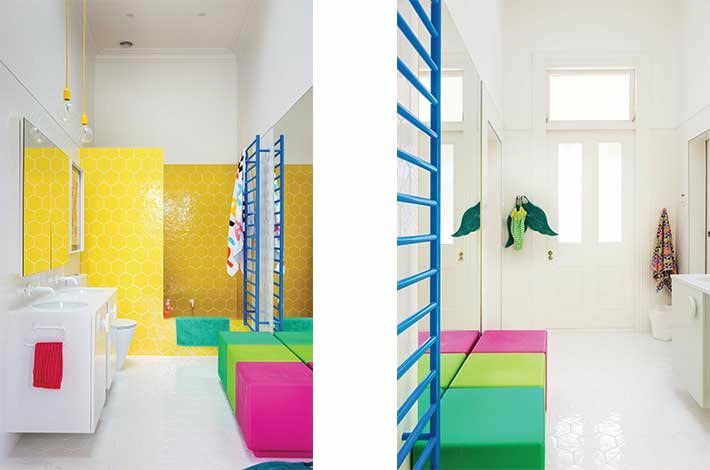 Spraying the heated towel rail in Dulux Boyzone (Blue) was another way to add some fun and colour without over powering the space.